From SEAGREENS® Icelandic production, on the cusp of the Arctic Circle, we are proud to offer the best quality Ascophyllum nodosum (Knotted Wrack) ever produced. Ascophyllum nodosum is an exceptional, certified organic seaweed powder, that unlike high temperature heated seaweeds on the market (e.g. Kelp), is processed using ground source heat and ambient air circulation technology which entirely removes the need for fossil fuels to dry the seaweed. It shows in the taste and the improved levels of nutritients. The bulk of the live enzymes and other delicate nutrients are retained. Approved for use in Biodynamic® and Organic foods in line with EU organic, and NOP organic standards. Seagreens® is Certified Organic in the EU and USA by the Biodynamic Association. Seaweed is the richest food state source of minerals on the planet and contains all of the ionic minerals and trace elements (and some colloidal) that your body requires. Organically certified wild wrack, harvested to Seagreens® human food quality standardsTM in the cusp of the Arctic Circle in Iceland. It provides the richest food state minerals to restore and protect health. It contains all minerals and trace elements, 90 in all, a wealth of vitamins, amino acids, unique polysaccharides, and many other phyto-nutrients. It is carefully processed to preserve the live enzymes that are not available in the vast majority of other dried seaweeds. Adults (Over 8 Years): 3 to 9 capsules daily. Children (2 to 8 years): 1 to 3 capsules daily. Many nutrients are missing from food and soil, but Seagreens® give you all of the nutrients from the ocean - nature's most complete nutrient 'store'. This mineral-rich food helps the body to keep its alkaline/acid balance; a unique range of polysaccharides removes pollutants and toxins including heavy metals; special pigments including chlorophyll clean blood & kidneys; better food absorption keeps us 'clean'. Breaking the cycle of detox, tox, detox can be achieved by a pure foods diet including Seagreens® as its permanent daily foundation. Seaweeds contains numerous natural aids to cleanse the body of toxins, pollutants and heavy metals. It isn't just external pollutants that should concern us. The food we eat can be just as toxic if not efficiently digested and metabolised. Alkaline Seagreens® improve the full digestion and metabolism of nutrients from other foods, purify the blood and body cells and feed the thyroid/hormone system, all regulating weight. Fibre that is different from land plants strengthens intestine, flora and bowel and protects against bacterial ulcers. This is the world's most alkaline-forming food, 70 times more so than fresh apples! Long-term daily use has a cumulative effect - the gradual and subtle strengthening of the body's own defences and the ability to regain equilibrium faster. Seagreens® Ascophyllum Nodosum re-mineralises the cells and increases circulation to the surface of the skin while the full spectrum of mineral trace elements supports the metabolism of all-important essential fatty acids. Seagreens® Ascophyllum Nodosum delivers virtually every nutrient including vitamins, minerals, protein, and fibre micronutrients in significant, balanced amounts. They are the only nutritional capsule to contain Nature's full quotient of all the minerals including the rare trace elements like gold, platinum and silver - which simply do not feature in synthetic or even natural formulated supplements. This product puts the missing nutrients back into everyday food. Seagreens® contain 5 of the 8 essential Glyconutrients. Seagreens® Ascophyllum Nodosum 1 gram / 1,000 mg supplies 700 ug (700 micrograms) of Iodine.
" The first nail in the iodine coffin was the publication by Wolff and Chaikoff from U.C. Berkley in 1948 (3), describing their finding in rats administered iodide in increasing amounts by intraperitoneal injection. When serum inorganic iodide levels reached 0.2 mg/L, that is 10-6M, radioiodide uptake by the thyroid gland became undetectable. The correct interpretation would be: Iodide sufficiency of the thyroid gland was achieved when serum inorganic iodide levels reach 10-6M, as we previously discussed (4). But Wolff and Chaikoff concluded that serum inorganic iodide levels at a concentration of 10-6M blocks the synthesis of thyroid hormones, resulting in hypothyroidism and goiter. These authors did not measure thyroid hormones in the rats studied. Hypothyroidism and goiter were not observed in those rats. This fictitious phenomenon became known as the Wolff-Chaikoff Effect (5). Because these law-abiding rats refused to become hypothyroid and instead followed their normal physiological response to the iodide load, they were unjustly accused of escaping from the law of the Wolff-Chaikoff Effect. Labeling these innocent rats as fugitives was a great injustice against these rodents. The second and final nail in the iodine coffin was hammered in by Wolff in 1969 (5). By 1969, Doctor Wolff had moved to the National Institute of Health from U.C. Berkley. Wolff arbitrarily defined 4 levels of "iodine excess". The first level of excess started with intake above 0.2 mg/day, and iodide intake of 2 mg or more was considered "excessive and potentially harmful". "60 million mainland Japanese consume a daily average of 13.8 mg of elemental iodine and they are one of the healthiest nations, based on overall wellbeing and cancer statistics (4). Japanese women do not stop consuming iodine-rich foods during pregnancy, and Japanese fetuses are exposed to maternal peripheral levels of iodide at concentrations of 10-5M to 10-6M (1-4). Either the Japanese are mutants, capable of striving on toxic levels of iodine or we have been grossly deceived, and the human body needs at least 100 times the RDA, which was established very recently in 1980 and confirmed in 1989!! (7)." Seagreens® are formulated exclusively from young plants of wild arctic wrack. Due to the habitat they are nutritionally outstanding. We harvest the plants at peak times for nutritional balance and immediately preserve their goodness by warm air drying and special micronizing and milling technology. Seagreens® Food Capsules contain varieties of the most nutritious 2 - 4 year old arctic wrack found in the extremely cold waters of the Outer Hebredian islands. Harvesting times are chosen to benefit from seasonal variations in the concentrations of nutrients. The area is government monitored, free from pollution and radionucleids*. Each plant is cut so that the seaweed continues to grow. Much common kelp on the market (often laminaria) is mechanically harvested (dredged) in huge quantities, mostly for die alginate industry rather than human consumption and may be left on a quayside for days, even weeks, before processing. Rotational harvesting causes no harm to the plants or marine environment. Our business aims to be 100% environmentally benign. Approved by the Vegan Society. Approved by the Vegetarian Society. Approved and prescribed by ION and BANT nutritionists, BHMA and NIMH Medical Herbalists and NHS dieticians. Since their introduction in 1998 Seagreens® have been Certified Organic. Other Nutrients - chlorophyll, enzymes, lipids, lipoproteins and important organic compounds that cannot be 'formulated'. Finding our natural nutritional balance means addressing the causes of health restoration. This is quite different from "supplementing” certain isolated vitamins and minerals that may be required in larger amounts from time to time. Modern diets are often very acid forming, in comparison; seaweeds are the most alkaline forming foods. For example wakame is 25.6 times more alkaline forming than common kelp or laminaria seaweed, 77 times more alkaline than apples, and over 1000 times more alkaline forming than milk, even though all these are also alkaline forming foods. Seaweed is the most world's most alkalising food and an ideal dietary component to help maintain the acid/alkaline balance in blood and cells which our bodies work very hard to maintain in a state of minor alkalinity. In "Acid & Alkaline”, Herman Aihara - among the most scholarly proponents of macrobiotic living shows that acids produced by carbohydrate, protein and fat are poisonous to the body and must be rapidly eliminated, but if this was done through the kidneys and large intestine those organs would be damaged by the acid. Very bio available. Mineral-rich seaweed helps the body neutralize these acids so that they can be safely eliminated. 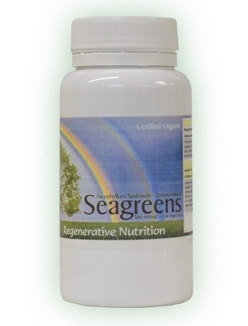 Seagreens® are rich in all the antioxidant vitamins and minerals, chlorophyll to cleanse the blood and kidneys, and a range of special polysaccharides (fibre), which bind, neutralize and remove toxic substances from the body including heavy metals, but are easily metabolised natural sugars. Of particular importance among these polysaccharides is alginic acid, which like the pectin in fresh apples, binds and removes metals such as barium, cadmium, lead and mercury. Others of these remarkable polysaccharides, like mannuronic acid, laminarin and fucoidin, are being widely studied in the search for anticancer and anti tumor compounds. In the 1960s Japanese scientists showed that radioactive strontium in the gut is bound by these polysaccharides, turning the strontium into an insoluble salt which is excreted. The science journal Nature published a report showing that arctic wrack seaweed inhibits the body's absorption of radioactive strontium and cadmium by up to seven-eighths the dose received. It also removed Strontium 90 already absorbed through the gut wall and deposited in body tissues and bone. Some of the nutrients most useful to our bodies can also become toxic and fattening when other nutrients the body needs to metabolise them are insufficient or missing from the diet. This is the more subtle value of Seagreens® for weight regulation and detox, because it conveniently ensures the balanced presence of virtually all the nutrients on a daily basis. A single nutrient may involve hundreds of others in its full metabolism, for example Vitamin C needs B and the mineral calcium; calcium needs vitamin D; C is needed by E, vitamin B 12 needs the mineral cobalt; B6 needs B2 and magnesium, and so on. *Many people wrongly believe the oceans to be very polluted, which is not the case. Even off the Kola Peninsula where the Russians once dumped nuclear waste, the hinterland is more polluted than the ocean. Another concern is radioactivity, but arctic wrack is a scientifically proven natural defence! "Even off Britain's coastal nuclear processing plant at Sellafield you would have to eat a vast amount of seaweed before your level of radioactive intake became of serious concern. Even then, the alginic acid in the seaweed would prevent you from absorbing the active metals into your body" - Marine Biologist S. Surey-Gent in Seaweed, Whittet Books 2000. Japanese scientists demonstrated in the 1960s that radioactive strontium in the gut is bound by seaweed's unique polysaccharides, turning the pollutant into an insoluble salt which are excreted. Radio strontium already in body tissue and bone is likewise removed.